Although many people may not realize it, life insurance can be one of the most important tools that is included in your overall financial planning "puzzle." While most people understand that saving and investing is essential for having financial security in the future, it is life insurance that can ensure the protection of those assets for your loved ones in case of the unexpected. In fact, without life insurance coverage, your loved ones and survivors are likely to have their lives changed drastically, and they could even face a major financial hardship. Even for those who know just how important it is to carry an ample amount of life insurance coverage, though, this type of protection can oftentimes be quite costly. This is especially the case as one ages and may run into various health conditions. Yet, while the price of life insurance policies will generally rise due to one's increasing age and potential for adverse health, the good news is that if you know how and where to shop for life insurance coverage, you may be able to find much more affordable life insurance policies - often while still securing the same amount of protection that you need. In obtaining less expensive coverage, one of the first key steps is to have a good understanding of how life insurance works. In doing so, just like comparison shopping for any other type of product or service, the more you know ahead of time, the better off you will be when seeking out the very best value for your premium. This will help you in comparing all of the options that you have - and in getting the very best value for your money. Some of the most affordable types of life insurance policies that are available in the marketplace today include term life insurance and final expense life insurance coverage. Your age, health, and needs will typically dictate which of these would be the best option for you. In the life insurance marketplace, one of the best values for many policyholders is term life insurance coverage. One reason for this is because term life insurance provides pure death benefit protection only, without any cash value build up. Just as its name implies, term life insurance can be purchased for a certain period of time - or term. The time period may be for just one-year increments, such as in annual renewable term life insurance policies. Or, it can be purchased for longer periods of time where the coverage - and the premium - are guaranteed, such as for five years, ten years, 15 years, 20 years, or even for 30 years. Term life insurance can provide an excellent opportunity to obtain a large amount of death benefit protection for very little premium outlay - especially for those who are young and in good health. This may include young couples who are just purchasing a first home, new parents who are just starting a family, or new business owners who are wanting to protect their investment and not leave partners or co-owners without a way to purchase their share of the company in case of the unexpected. It is important to note, though, that once the term of the policy has expired, the coverage on a term life insurance policy will also expire. Therefore, if the policyholder wishes to remain covered with life insurance, he or she will either need to purchase a new policy, or they will have had to convert their term policy over to a permanent type of insurance. (There are some term life insurance policies that will allow the insured to convert their policy over to a permanent form of life insurance. This typically must occur within a certain period of time. Sometimes, the insured is allowed to do so without having to prove evidence of insurability). Should the coverage run out and the insured have to go back through underwriting again, they will often need to do so at their then-current age and health condition. If this is the case, then the premium on the new life insurance policy is likely to be higher than the premium amount on the previous coverage. 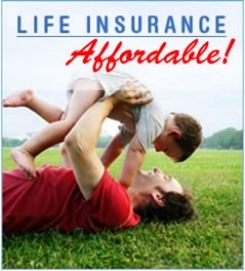 Another type of affordable life insurance policy is a burial policy. While burial insurance works like most other types of life insurance policy in that it pays out a death benefit in return for payment of a premium, these plans are typically purchased with the intent of using the proceeds to pay off one's funeral and other related expenses. Today in the United States, the average cost of a funeral can be in excess of $10,000 - especially when factoring in all of the ancillary costs such as one's burial plot, headstone, transportation, flowers, and the memorial service itself. Unfortunately, many of the loved ones of a decendent do not have this amount of cash readily available to spend for a person's final expenses. And, when there are additional final - and uninsured - medical and / or hospice costs that may also be included, the financial hardship for the person's loved ones may even get worse. This is where a burial life insurance policy can be a good solution. These policies will typically have a face amount of between $5,000 and $50,000 - although there are some life insurance carriers that provide policies offering more. Typically, burial policies - also oftentimes referred to as funeral or final expense insurance - are purchased by those who are between the ages of 50 and 80. Because their face amounts are in the lower range, the premiums that are charged for burial life insurance are not very high. By keeping the cost more affordable, those who are living on a fixed budget can often continue paying the premium for this protection. Burial insurance can also be easier to qualify for than many other types of life insurance coverage. This is because many of the final expense policies on the market today do not require an applicant to undergo a medical exam for underwriting purposes. This can make qualifying for coverage easy and fast. In addition, because many burial insurance policies are permanent coverage, the premium is locked in throughout the life of the policy. This means that you won't have to worry about the amount of the premium rising in the future. Also, as long as you continue to pay the premium, the life insurance company cannot cancel your coverage for any reason - so you know that you will have protection throughout the remainder of your lifetime, regardless of increasing age, or even of any type of adverse health condition that you may incur. When seeking quotes on affordable life insurance policies, it is usually the best option to work with either an agency or a company that has access to more than just one life insurance carrier. This is because in doing so, you will be able to more directly compare, side-by-side, in an unbiased manner, multiple life insurance policies, as well as their benefits and premium prices. From there, you will be able to determine which of these will work the best for you and your specific needs. While many life insurance policies may appear to be the same, what many people do not know is that all life insurance companies do not underwrite their applicants in an identical manner. What this means is that an applicant at one life insurer may be able to obtain a life insurance policy for a much lower premium price at another insurance carrier - for the exact same amount and type of coverage. With that in mind, it pays to shop around. But, doing so can take a great deal of time if you have to go from one company to another. Therefore, a much better alternative is to use a company that has already done the shopping for you. When you're ready to start comparing, we can help. We work with many of the best and affordable life insurance companies in the industry - and we can assist you in getting all of the information that you need on affordable life insurance policies. When you're ready to start shopping, fill out the form at the top of this page to get your first set of quotes. If you find that you have any questions at all, we can also assist you with your needs. We can be reached directly via phone, toll-free, by dialing 877-235-9299. Please feel free to contact us with any question or concerns that you may have. We understand that shopping for any type of life insurance can be somewhat confusing. There are many variable to consider - and you want to ensure that you are getting the right coverage for your loved ones, along with the very best price. So, contact us today - we're here to help.